In this world, without knowing the true nature of chith (soul), achith (matter) and Iswara (bhagavAn), without engaging in any of the proper means to achieve the ultimate goal, being engrossed in sensual pleasures, jIvAthmAs are fully drowned in this ocean of samsAram (material world) which is difficult to bear and cross-over. It is said in srI bhAgavatham 11.2.29 “dhurlabhO mAnushO dhEhO dhEhinAm kshaNabangura: thathrApi dhurlabam manyE vaikuNtapriya dhasranam” (It is very rare to acquire a human body which itself is temporary. Even rarer is to be blessed by the vision of one who is dear to srIvaikuNtanAthan). The human form is the best form to pursue the ultimate goal of liberation. Even if one desires for liberation, it may be limited to just being freed from samsAram as it is rarer to find one with the desire for ultimate form of liberation which is eternal kainkaryam to bhagavAn in srIvaikuNtam. Considering, this it can be easily understood that the desire to perform eternal kainkaryam to bhAgavathas (devotees) can be the rarest. In such samsAram, as a great fortune and boon for the samsAris (bound souls), nammAzhwAr appears in AzhwArthirunagari. He acquired full/pristine knowledge by bhagavath prasAdham (mercy of bhagavAn). He is glorified as the top-most of gyAnis – those who are most dear to him as proclaimed by himself in gIthA 7.18 “gyAni thu Athma Eva mE matham” (that gyAni is my soul – this is my philosophy). He is attached to emperumAn right from his birth and holds emperumAn as the one who sustains him (unlike samsAris who sustain themselves by food, water, etc). He cannot bear even a moment considering anything other than bhagavAn as the goal. Like arjuna, dhasaratha, etc., he wants to pursue bhagavAn eternally and will still not be satisfied with his uncontrollable desire towards bhagavAn. His glories are such that even srI mahAlakshmi and other dear consorts of srIman nArAyaNan, srI lakshmaNa, srI bharatha, srI gOpikAs, etc., cannot be considered equivalent to him. Just like srI prahlAdhAzhwAn is considered as the best example of sAdhus (devotees), nammAzhwAr‘s each aspect can be considered as an example of many great personalities’ qualities. While being completely overwhelmed by bhagavAn‘s auspicious qualities, considering himself as bhagavAn‘s servant, being situated at the top-most platform of exclusive devotion to bhagavAn, being in a mood of servitude and serving bhagavAn in all possible ways, his presence itself dispelling the ignorance (that exists in the form of ahankAram (considering AthmA as body) and mamakAram (considering oneself as the proprietor of oneself)) of everyone to purify them fully to make them eligible for eternal kainkaryam to bhagavAn in paramapadham, out of his overflowing emotions, he sung thiruviruththam, thiruvAsiriyam, periya thiruvanthAdhi and thiruvAimozhi dhivya prabandhams that clears all doubts that may arise from studying vEdham, vEdhAntham, ithihAsam, purANams, etc. If this is the outcome of nammAzhwAr‘s overflowing emotion – how does these have proper count of pAsurams, proper grammatical structure, etc? Just like by brahmA’s mercy/boon, the curse which was recited by vAlmIki out of sorrow (in seeing the male dove being hunted down by a hunter) turned into a slOka and eventually lead to the reciting of srI rAmAyaNa, this prabandham (and other dhivya prabandhams) too came out to be perfect by the grace of bhagavAn. In which category, these dhivya prabandhams belong to? These dhivya prabandhams fall under the category of the main literature that focus on purushArththam (ultimate goal). How did these prabandhams come into existence? Being engrossed in bhagavath anubhavam (divine experience with bhagavAn) which leads to great bliss that facilitated the arrival of these prabandhams. What is the source for these prabandhams? How do we know the source? As learnt from the tune, the words in the prabandham itself, etc., we can understand that the divine vision blessed by bhagavAn‘s mercy is the source for these prabandhams. How would we know that these are pramANam (authentic source)? Since these prabandhams are pursued by great scholars of vEdhAntham and as these prabandhams reveal the essential principles to relieve oneself from samsAram, we can understand that these are authentic sources of information. Who is the propagator for this? srIman nArAyaNan who is the divine consort of srI mahAlakshmi and who is the goal for everyone is the propagator of these prabandhams. Who can learn these prabandhams? The ones who have detachment in worldly pleasures and who want to somehow serve bhagavAn in all ways are the qualified persons to learn these prabandhams. Who is the enjoyer of these prabandhams? mumukshus (ones who seek liberation), mukthAthmAs (liberated souls), nithyasUris (eternally free souls) and srIman nArAyaNan are the enjoyers for these prabandhams. What is the purpose of these prabandhams? To elaborate the nature of kainkaryam to bhagavAn which is most blissful. Again a series of objections are raised (by ignorant persons) to minimize the greatness of dhivya prabandhams and these are explained clearly by nanjIyar. They are in nishidhdha (forbidden) language, so they should be discarded. Not necessarily – Though samskritham is considered as dhEva bhAshA (divine language) and other languages are considered inferior to samskritham, any devotional literature on hari (srIman nArAyaNan) is to be glorified irrespective of the language they are written on. This is explained by yamadharmarAja in mAthsya purANam. If the language is the only criteria to accept a literature, then one should accept extraneous literature that are written in samskritham which are contrary to vEdham as well. Since that is not meaningful, language alone cannot be used to determine the validity of the literature. These are pursued by women, sUdhras, etc., so they should be discarded. Not necessarily – It is by the great mercy of nammAzhwAr, even women, sUdhras, etc., can pursue these literature which reveals the essence of vEdham/sAsthram – this is actually a good reason to accept these greatly. These are compiled by a sUdhra who dont have the qualification to preach in the kaliyugam, so they should be discarded. Not necessarily – Since nammAzhwAr is most fortunate to be most dear to emperumAn himself who pursued nammAzhwAr for several births, who is the abode of bhagavAn‘s eternal mercy, who is expert in thathvam (truth), hitham (means) and purushArththam (goal), who is also an expert in preaching the same, who is even greater than vidhura, sabhari, etc., who are most dear to emperumAn, these prabandhams are to be pursued. These are seen only in one place (thamizh dhEsam) not in many places, so they should be discarded. Not necessarily – Even thamizh is spoken in many places that are filled with great saints and even great scholars of samskritham crave to be born in these regions where thamizh is spoken to learn and recite dhivya prabandhams, these prabandhams are to be pursued. These are pursued by avaidhikas (one who does not accept vEdham as pramANam), so they should be discarded. Not necessarily – these are so great that even avaidhikas are inspired and become transformed into vaidhikas, they should be glorified. These speak about kAmam (love/lust) which is contradictory to sruthi and smruthi – so they should be discarded. Not necessarily – the kAmam spoken here is the same as bhakthi, upAsana, etc., that is spoken in vEdhAntham. So, these should be pursued. These discard goals such as aiswaryam (worldly pleasures), kaivalyam (self-enjoyment) which are elaborated in sruthi and smruthi, so they should be discarded. Since aiswaryam and kaivalyam have the defects of being temporary and insignificant respectively, they can be discarded. So, these prabandhams should be pursued. Further, due to these being revealed by bhagavAn‘s greatness, revealing his nature clearly, being the trigger for ones devotion, being the one that nurtures such devotion, giving endless pleasure just by hearing them, always quoting vEdhAntham for the principles explained in there, fully explaining brahmam (srIman nArAyaNan) as the ultimate cause of everything and explaining the principle of “brahmagyNan mOksham” (knowledge about brahmam leads to mOksham), the great scholars pursued these dhivya prabandhams as the most important ones among the literature that talk about purushArththam (goal). nammAzhwAr being fully knowledgable about bhagavAn, why does he feel separation from bhagavAn and sorrow from such separation? It is because, nammAzhwAr enjoys each auspicious quality of bhagavAn which leads to detachment from material pleasures and will further engage nammAzhwAr in bhagavAn’s qualities. But since he would not be able to fully enjoy bhagavAn due to being present in this material world still, he feels great sorrow. For great devotees of bhagavAn who always engage their mind in bhagavath vishayam, even other materialistic persons/aspects may seem like suffering from separation from emperumAn. They would even feel sorry for others considering they also are suffering in separation from emperumAn. Thus, nammAzhwAr goes through joy (when thinking about emperumAn‘s qualities) and sorrow (when thinking about presence in this material world) repeatedly. While it is generally said that one sustains, nourishes and enjoys by food, water, etc., how is it that nammAzhwAr considers all of that to be emperumAn? Just like it is said in srI rAmAyaNam that all the inhabitants of ayOdhya consider srI rAma’s auspicious qualities as every thing for them, it can be said the same for AzhwAr as well. For such AzhwAr, samslEsham (union) means prathyaksha samAnAkAra gyAnasAkshAthkAram (the emotional experience which feels like real physical experience). vislEsham (separation) means AzhwAr trying to experience the same in physical form and being unable to do so, feeling great agony due to that. bhagavAn let this disruption in AzhwAr‘s experience happen to give him some time to digest the previous experience and to nurture the devotion of AzhwAr to the fullest extent. Due to this constant union and separation, AzhwAr reveals different aspects (mainly artha panchakam). Some pAsurams speak about bhagavAn‘s nature; some about jIvAthmA‘s nature; some about the upAyam (means); some about the palam (goal); some about the virOdhi (hurdles). The main goal is to know about the palam (goal) – the other four aspects are spoken to explain about the goal in detail. Firstly, in thiruviruththam, AzhwAr prays to bhagavAn to mercifully eradicate the existence in this material world (and to uplift him to the spiritual world). Then, in thiruvAsiriyam, he becomes blissful experiencing bhagavAn who is enjoyed by the ones who are relieved from this samsAram. In periya thiruvanthAdhi, having developed great devotion, he sustains himself by speaking/meditating on him. 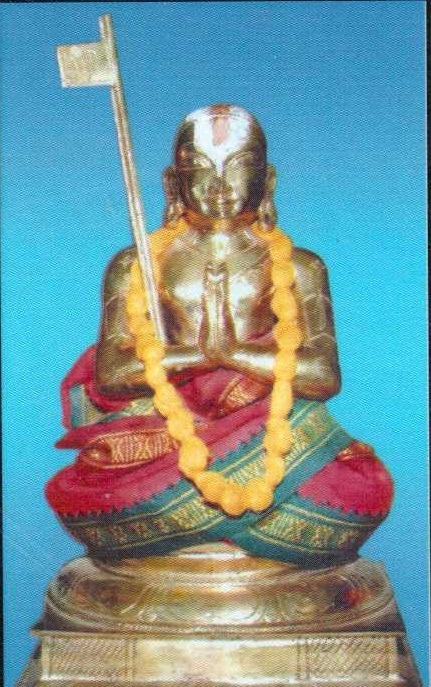 In thiruvAimozhi, AzhwAr speaks about bhagavAn who is fully qualified to be glorified by AzhwAr‘s devotion, who is seated on a divine throne in srIvaikuNtam with a divine form, divine ornaments, divine weapons, divine consorts, etc., being served by the divine souls, out of his compassion, descends as vibhava avathArams (incarnations) to uplift jIvAthmAs and seeing that it is not sufficient to help them, he further descends as archAvathArams where everyone can approach him, develop their devotion, serve him and be uplifted. nammAzhwAr also understands and speaks about how emperumAn compassionately reveals himself, how emperumAn mercifully eradicates AzhwAr‘s worldly connection (without any effort from AzhwAr) and finally brings him to paramapadham as well. Further explanations will follow in each pAsuram, padhigam, etc. prathamAchArya (first AchArya) nammAzhwAr being unconditionally blessed by srIman nArAyaNan to uplift everyone out of his great compassion, revealed 4 prabandhams in thamizh language which bring out the essence of all of sAsthram and that develop unlimited devotion towards bhagavAn who is filled with unlimited auspicious qualities for everyone (without any specific qualification). Among these, in thiruviruththam, AzhwAr prays/desires for the eradication of worldly connection. In thiruvAsiriyam, he enjoys the auspicious qualities of emperumAn which is desired by the ones who are freed from samsAram. In periya thiruvanthAdhi, the devotion which was developed by such auspicious qualities are spoken. In thiruvAimozhi, he becomes fully satisfied and grateful by fully experiencing bhagavAn. In this thiruvAimozhi, the principles of elders that emphasis on srIman nArAyaNan who is the divine husband of srI mahAlakshmi, will himself be the means for jIvAthmAs in removing the hurdles that stops them from achieving him and will also himself bestow the ultimate goal of blissful kainkaryam in paramapadham. This prabandham fully explains the artha panchakam – five essential principles of paramAthma svarUpam (God), jIvAthma svarUpam (soul), upAya svarUpam (means), upEya svarUpam (goal) and virOdhi svarUpam (hurdles). In this, first 4 centums explain the paramAthma svarUpam and jIvAthma svarUpam, last 4 centums explain the virOdhi svarUpam and pala svarUpam and 5th and 6th centums explain the upAya svarUpam. In this, the first 2 centums speak about bhagavAn/paramAthmA. The 3rd and 4th centums speak about the jIvAthmA. The 5th and 6th centums speak about saraNAgathi – total surrender. The 7th and 8th centums speak about the hurdles. And finally, the last 2 centums speak about the attainment of ultimate goal. 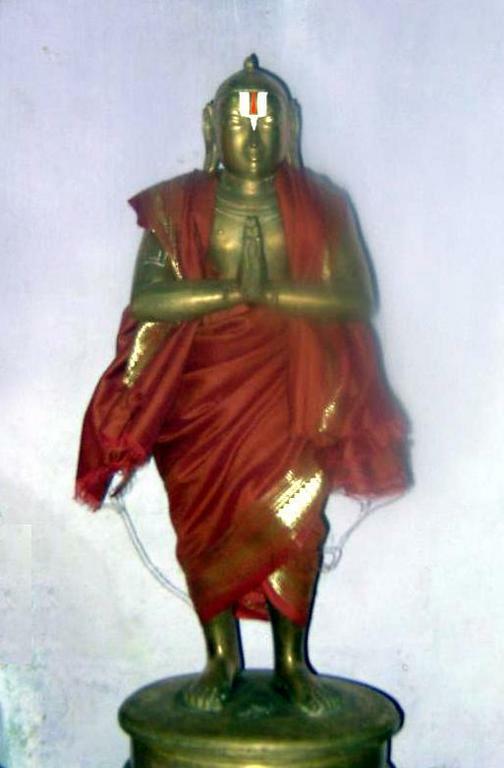 This avathArikai quite closely follows nanjIyar‘s vyAkyanam. In the next article, we will see nampiLLai‘s introductions – he has given 3 different introductions for his Idu vyAkyAnam. This entry was posted in thiruvAimozhi on March 13, 2015 by Sarathy Thothathri. thanks for highlighting it swamy. Corrected now.